I know I am not alone when I say that I don't like the new unity interface. I am using the Ubuntu Netbook Edition on my Asus EEEpc and my biggest complaint is that it is too slow. I like the idea of a better interface, but they have a long way to go to make it usable. Until then I will be sticking with the standard GNOME interface which is still included to use. I am going to show you how to change the default session to be the regular desktop session. 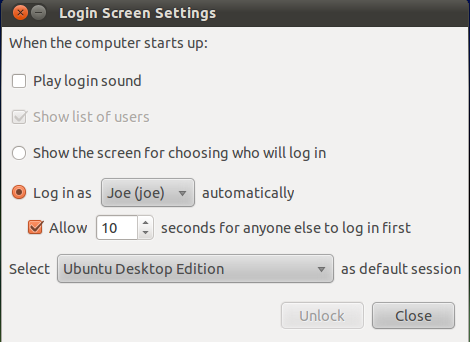 Open the Login Screen Settings dialog box. Change the bottom dropdown box to be Ubuntu Desktop Edition as the default session (you can see I already have mine changed). You may need to press the Unlock button and supply your password to be able to change this setting. 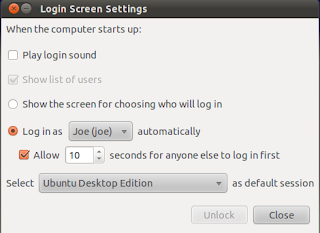 You should just be able to log out and back in and then you will get the familiar GNOME desktop. This will not actually remove Unity from your installation so at what time you think you might want to use it again you could. I've read a few posts that take you through the steps to remove it, but I don't see it necessary since it can be easily disabled through the login screen. Is there any alternate way to install this? This method is not working in my Ubuntu version..